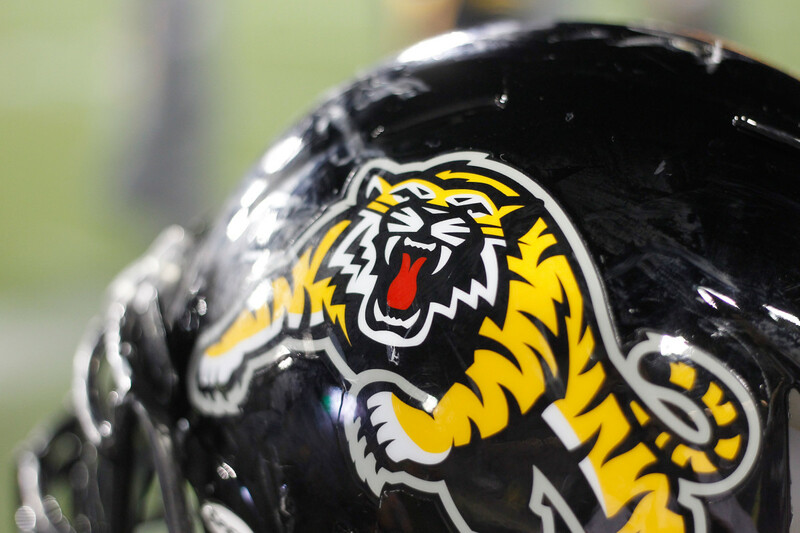 The Hamilton Tiger-Cats announced Friday that the club has signed all eight of its selections in the 2016 Canadian Football League Draft from earlier this month, including offensive lineman Brandon Revenberg, running back Mercer Timmis, wide receivers Mike Jones, Felix Faubert-Lussier and Matt Uren, linebackers Terrell Davis and Mitchell Barnett, and defensive back Elroy Douglas. Revenberg, 23, was selected third overall in the first round of the Draft. He played 32 games at Grand Valley State University from 2012 to 2014, earning three varsity letters. The 6-4, 285-pound native of Essex, Ontario, played every position on the offensive line during his time at Grand Valley State, and was named to the Academic All-GLIAC team in 2014. Timmis, 22, was selected in the second round, 14th overall. He played four seasons at the University of Calgary from 2012 to 2015, posting 392 carries for 2,987 yards and 43 touchdowns in his CIS career. The 6-1, 220-pound native of Burlington, Ontario, was named a CIS first team All-Canadian and Canada West all-star in the last three years of his career with the Dinos, and helped lead his team to a Vanier Cup appearance in 2013. Jones, 23, was selected 18th overall and was Hamilton’s first of two third-round picks. He played 39 games at Southern University, recording 49 receptions for 919 yards and six touchdowns with 16 kick returns for 237 yards. The 6-0, 189-pound native of Bryan, Texas, was part of the Jaguars NCAA conference championship-winning team in 2013. Davis, 22, was a third-round pick, 21st overall, and Hamilton’s fourth selection in the Draft. He played one game at Arizona State University in 2013 before transferring to UBC where he played 16 regular season games over two seasons (2014-15) at both running back and linebacker. He rushed 36 times for 186 yards and one touchdown, and had eight receptions for 41 yards in 2014. The 6-0, 225-pound native of Victoria, B.C., converted to linebacker in 2015 finishing third in the CIS with 56.5 tackles, while adding 4.5 sacks and seven tackles for loss en route to a Vanier Cup triumph. Faubert-Lussier, 24, was selected 39th overall and was Hamilton’s first of two fifth-round picks. He played 31 games for Laval University from 2012 to 2015, posting 99 receptions for 1,383 yards and 14 touchdowns. The 6-0, 215-pound native of Montreal, Quebec, won back-to-back Vanier Cups in 2012 and 2013, and led his team in receptions (42) and touchdown receptions (3) in 2015. Douglas, 23, was a fifth-round pick, 41st overall, and Hamilton’s sixth selection in the Draft. He played 40 games at Missouri Western State University over four seasons (2012-15), collecting 54 total tackles, one interception, 10 pass break ups and two forced fumbles. The 5-11, 175-pound native of Fort Lauderdale, Florida, played in 33 consecutive games in his final three seasons. Barnett, 23, was selected in the seventh round, 59th overall. He played 12 games in the 2015 season for the University of British Columbia, recording 101 tackles, six sacks, one forced fumble, two interceptions and three pass break ups. The 6-1, 192-pound native of North Vancouver, British Columbia, won the Vanier Cup with the Thunderbirds in 2015 playing linebacker alongside Tiger-Cats third-round pick, Davis. Uren, 24, was selected in the eighth round, 67th overall, and was Hamilton’s final selection of the Draft. He played 18 games at Western University from 2011-2015, posting 59 receptions for 800 yards and eight touchdowns. The 5-9, 182-pound native of London, Ontario, tied the OUA/CIS record with four receiving touchdowns in a quarterfinal win over Windsor in 2012, and also won the Dalt White trophy in 2013 as the Yates Cup MVP.